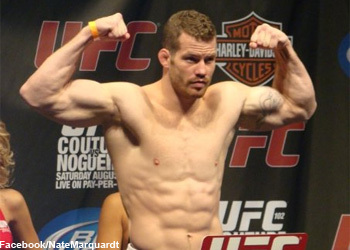 Nate Marquardt (25-7-2) was on top of the world heading into his Middleweight title bout against Anderson Silva (20-4-0) at UFC 73 back in July. Unfortunately he came up short against one of the top pound-for-pound fighters in the world. The Houston Chronicle’s Brawl Sports blog had previously reported that Marquardt had not been contacted by UFC matchmakers about a return to the Octagon since following the loss. “Joe Silva called this week to talk about my next fight and to discuss a new contract,” Marquardt told the Houston Chronicle’s Steve Sievert. After Silva’s second straight victory over former UFC Middleweight Champ Rich Franklin (22-3-0), the UFC is strapped for possible opponents to put against him. It’s possible that Marquardt’s last fight against Silva was just a bad night, but he’s going to have to work his way back up before he gets another chance to prove it. As for who Marquardt wants next? “I definitely want to fight Rich [Franklin], but I have a feeling it’s not going to happen,” Marquardt stated. According to the blog, Franklin wants to take some time off.